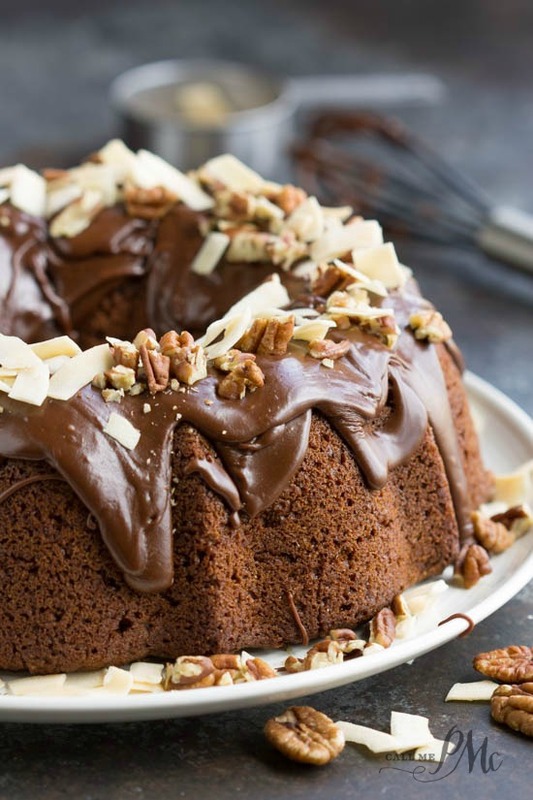 Chocolate Praline Bundt Cake is a decadent bundt cake recipe that’s smothered with chocolate ganache. 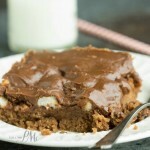 A surprise is baked into this cake giving it the praline flavor and it all starts with a cake mix! This rich and tender chocolate cake has a container of coconut pecan frosting baked into it giving it a moist and buttery flavor. 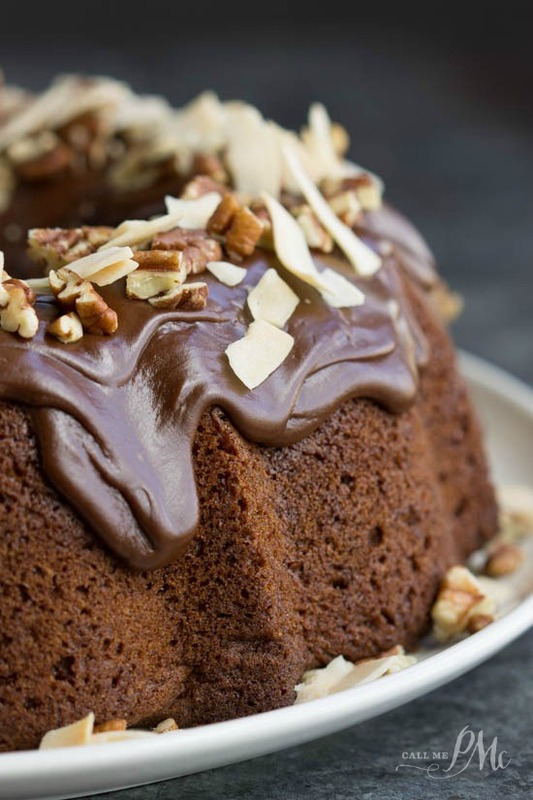 Chocolate Praline Bundt Cake starts with a cake mix. 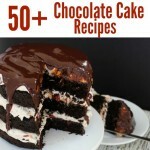 I love a cake mix; they make baking quick and easy. The fact is, aside from over-baking or under-baking, you can’t go wrong with a cake mix. You can make a cake per the package directions or you can change up the liquid, oil, and add-ins and make a completely different cake. 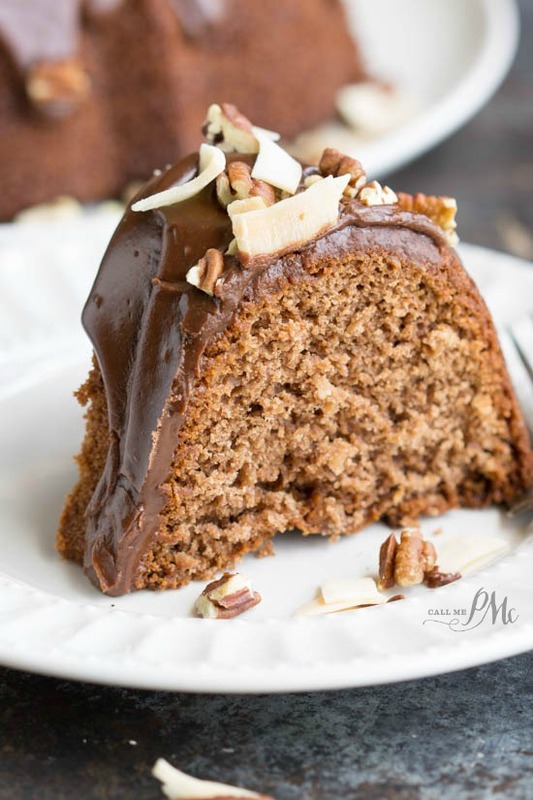 You can transform a cake from a mix into a gourmet creation like I’ve done with this Chocolate Praline Bundt Cake. I wanted to make a ‘fancier’ version of my son’s favorite cake, the Chocolate Coca Cola Cake, for his birthday celebration. I picked up Pillsbury cake mix and frosting for a quicker, albeit, easier, version of that chocolate cake. In addition to the ease of using a cake mix and frosting is this recipe, although very impressive to look at is super easy to make. All the ingredients, excluding the chocolate frosting, simply get dumped in the mixing bowl and stirred up together. It’s a great recipe to make memories with those kiddos and have them help you. #MixUpAMoment you or they will never forget! I also picked up Pillsbury brownie mix at Walmart, be sure to check back or sign up for my emails to see what I create with it! Also follow Pillsbury on Pinterest for more ways to #MixUpAMoment! 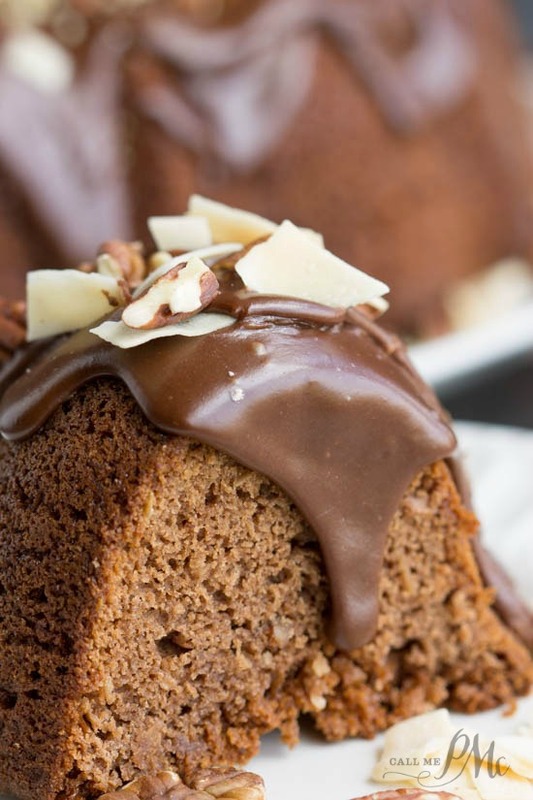 Chocolate Praline Bundt Cake is a rich chocolate pound cake smothered in a luscious chocolate ganache. Gourmet decadence that starts with a cake mix. Grease and flour a 10-cup bundt pan. Combine cake mix, oil, eggs, and milk. Beat well. Add frosting and stir until combined. Bake 45 to 50 minutes or until wooden pick inserted in center comes out clean or with dry crumbs. Cool 15 minutes in the pan before inverting to a serving platter to cool completely. Frost cool cake with chocolate frosting. Heat butter in a small pan on medium heat, do not let butter get brown. When butter is melted, whisk in cocoa, milk, and vanilla. Add sugar 1/2 cup at a time, whisking after each addition. Remove from heat, after the sugar has been added. If icing is too thin, add additional sifted sugar 1/4 cup at a time until desired thickness or sit it in the refrigerator a few minutes. Take it out and whisk it until creamy again. Frosting will thicken as it cools, but it'll be harder to spread. I’ve made these cakes with cake mix. Be sure to check them out. Instead of the can frosting could I just put peacans and coconut in the battery. I do not want to add more sugar. 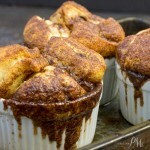 Hi Paula, I love your blog and appreciate all the effort you put into giving us the best recipes. 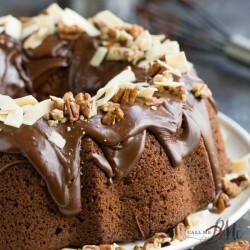 I love this Chocolate Praline Bundt Cake. In fact, I love anything that’s made from chocolate. Looks so tasty and yummy. Looks so yummy…. Can’t wait to make it! Looks DIVINE! Thanks so much! I wish I could grab it out of the screen and eat it right away!! !